The healing power of the earth has been used to detox the body from heavy metals, bacteria and other harmful toxins for centuries. Om Shanti is proud to offer you these wonderful benefits in a full body detox wrap! Choose from Seaweed, Aztec Indian Clay, or Moroccan Red Clay. All products are 100% pure, All- Natural giving you the most healing experience! Relax as your painted with your choice of products, then wrapped in a warm cocoon as you soak up all the nutrients each of these wraps has to offer! Product is removed with warm towels. 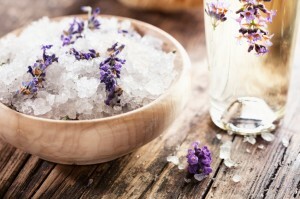 Ask about adding essential oils or flower powders to any wrap to create your own blissfuly healing experience! * Seaweed- Feel refreshed and hydrated with Seaweed gel made with Sea Kelp for metabolic stimulation and nutrient rich Klamath blue-green algae (the most nutrient rich of all algae). Great for hydration and detoxification. * Aztec Clay – Cleanse and detox with 100% natural calcium bentonite clay from Death Valley Nevada. This ancient clay draws out impurities and deeply cleanses and detoxes the body, leaving the body/ face feeling firm, smooth and refreshed. 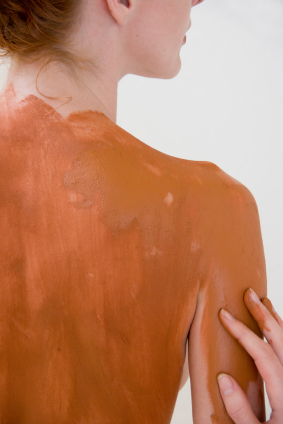 * Moroccan Red Clay- Moroccan red clay is considered one of the more rare and pure clays of the Earth. This firming, detoxing, cleansing clay is great for sensitive skin. 100% Pure Red Clay. These exfoliating body scrubs will not only massage away stress, tension, and dry, dead skin, but exfoliation helps with new cell generation, allowing new skin cells to form – leaving your body feeling healthy, soft, silky and smooth! All body treatment products are all-natural, pure and full of life energy!